MV Loch Seaforth was built specifically for the Stornoway-Ullapool service. Argyll and Bute MSP Michael Russell has tabled a series of written questions in the Scottish Parliament in pursuit of what he calls a “new approach” to the procurement of ferries. Mr Russell said his questions had been sparked by disruption on a number of CalMac routes in recent months - particularly those in his constituency serving Islay, Colonsay, Mull and Campbeltown - and by a desire to see new ferries capable of operating interchangeably on all routes. 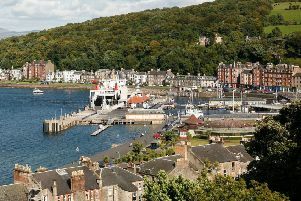 “At present Caledonian Maritime Assets Ltd, which procures the ferries used by CalMac, intends to go on building ever bigger and ever more sophisticated vessels primarily designed for specific crossings,” he said. “That needs to change. When such vessels are ordered there then has to be very substantial modification of existing pier and harbour infrastructure to accommodate them, with huge disruption and cost over a long period of time.